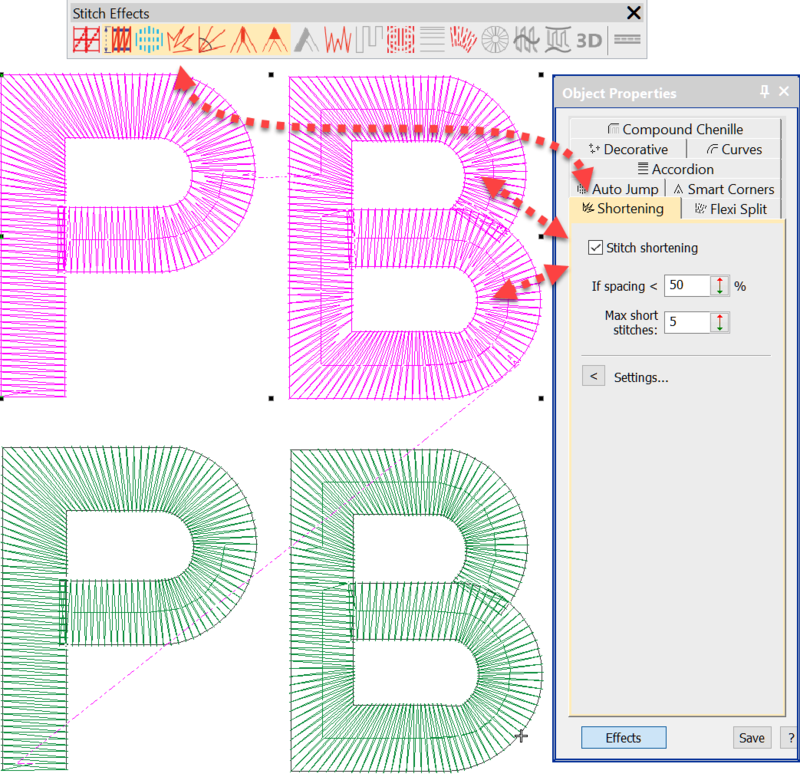 Stitch Spacing is a critical property for good design and may vary from one fabric to another and one object to another. 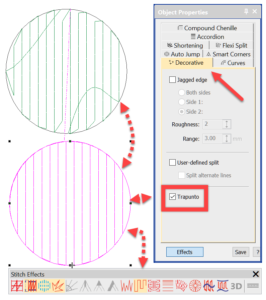 Understanding how to adjust for auto spacing in columns of satin and using the trapunto effect in tatami fill, will help you create more imaginative designs that run efficiently and reduce the chance of thread breaks. 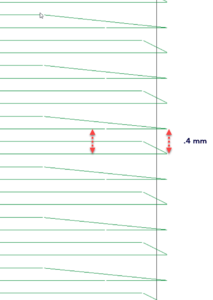 When measuring spacing in tatami fill the measurement can be taken from the end of the row or between every second line of stitching. Why each second row? the first is a stitch line and the next row is a back stitch so the measurement is taken on each second row. 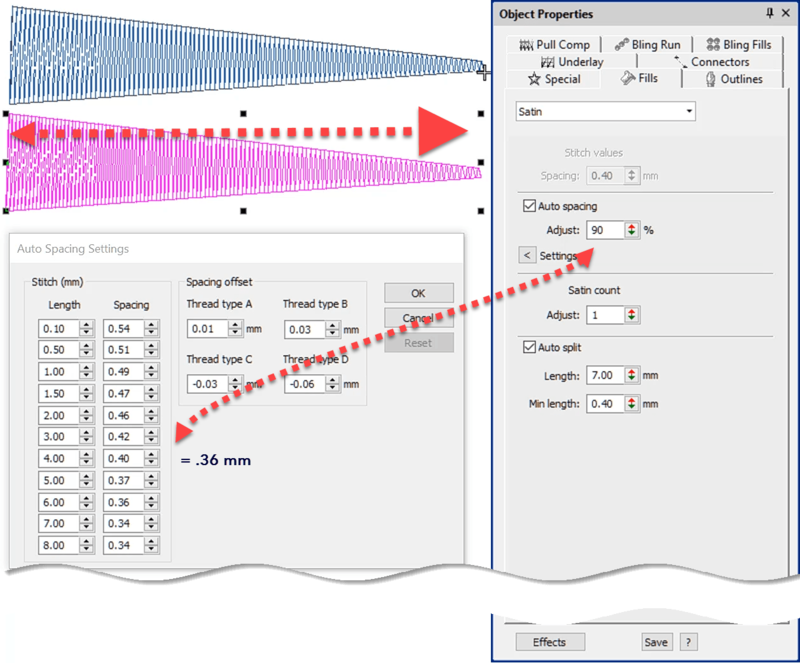 To adjust the stitch spacing in Tatami fill go to the Fills tab in the Object Properties dialog. Spacing in Satin columns is treated slightly differently and allows for stitch spacing based on the width of the column of stitching. We call this Auto Spacing, the settings may be adjusted in the Settings tab. If the column is x wide then use y spacing value, this can be further adjusted to say use a percentage of the value in the settings tab. e.g. if the spacing for a 4 mm wide cloumn is .4 mm then the Auto Spacing adjsutment of 90% will calculate the .4 mm to .36 mm and close the spacing. The lower the percentage the closer the spacing and the higher the percentage the wider the spacing based on the table. 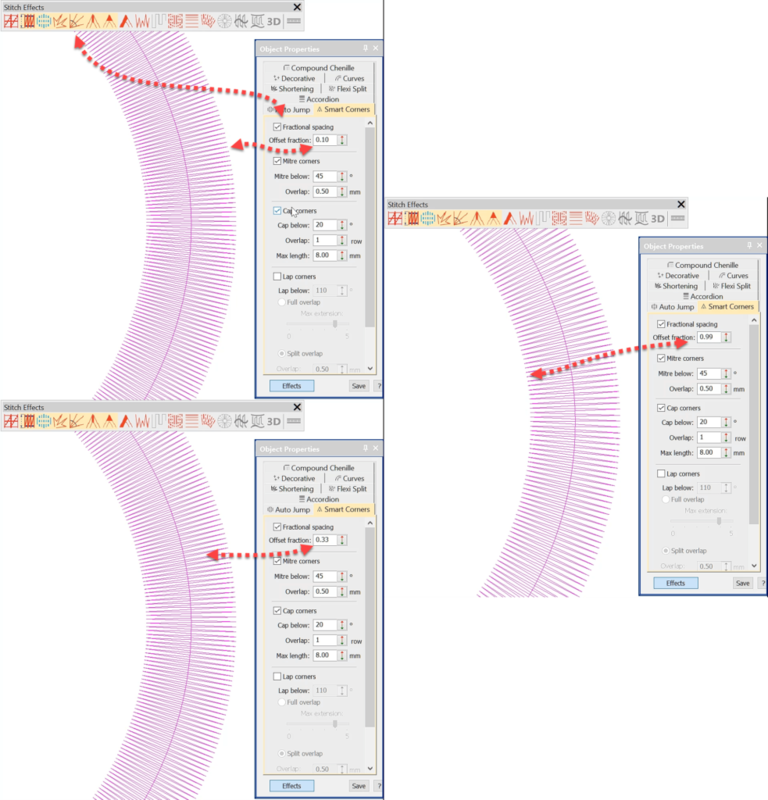 Wide spaced tatami stitching is referred to as Trapunto and is used in color shading and often to make larger areas of fills for backgrounds in a design. To avoid the travel runs under the open fill there is a trapunto setting that forces the travel runs to the edge of the object. Varies the spacing across the rows of stitching in tatami fill. 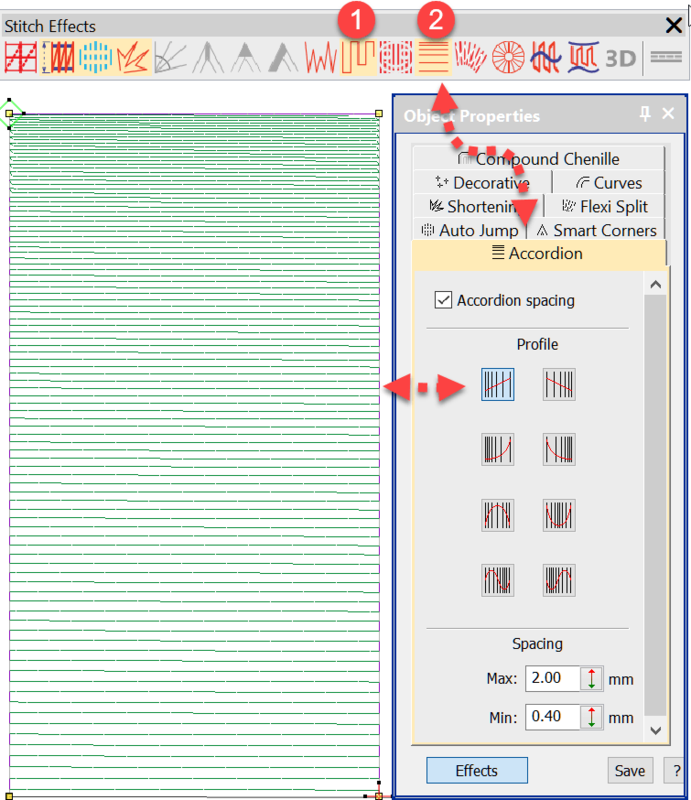 There are 8 profiles and an unlimited range for spacing. 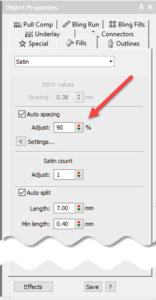 Controls when and by how much stitches are shortened on the inside of a curve. Too many bunched stitches on the inside of a curve not only looks ugly but will potentially cause thread breaks. Note in the bottom letters the stitches on the inside of the curve run all the way to the edge. determines now far in from the edge of a column of stitching the stitch spacing is measured. Used in combination with Shortening you can improve the look of the column stitch and reduce thread trims. Remember too many stitches bunched on top of each other will cause a thread break.